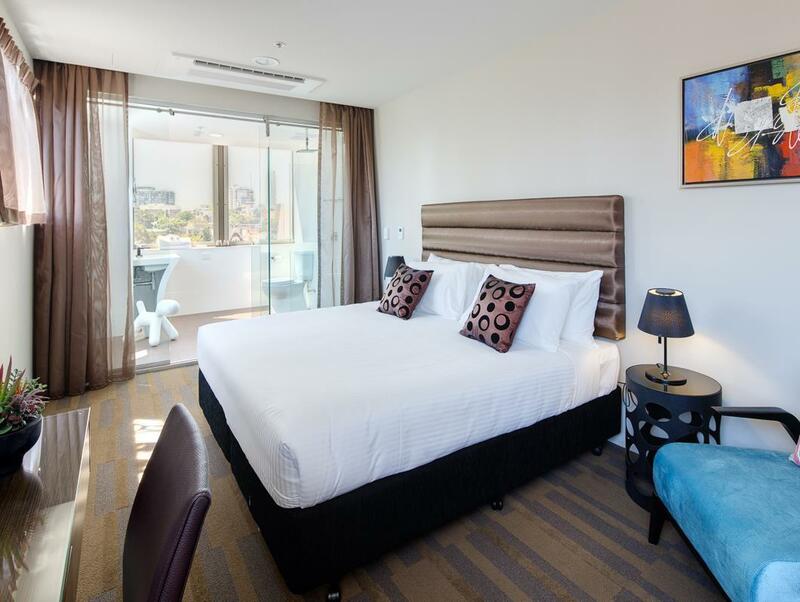 "The bed was nice (small but was sufficient for us), very cla..."
Have a question for 57 Hotel? "Pros- love the lobby with free water and coffee." "On a positive note the free water was a great initiative and so was the free Nespresso coffee machines." "The room was suitable for 3 adults, well presented and quiet." 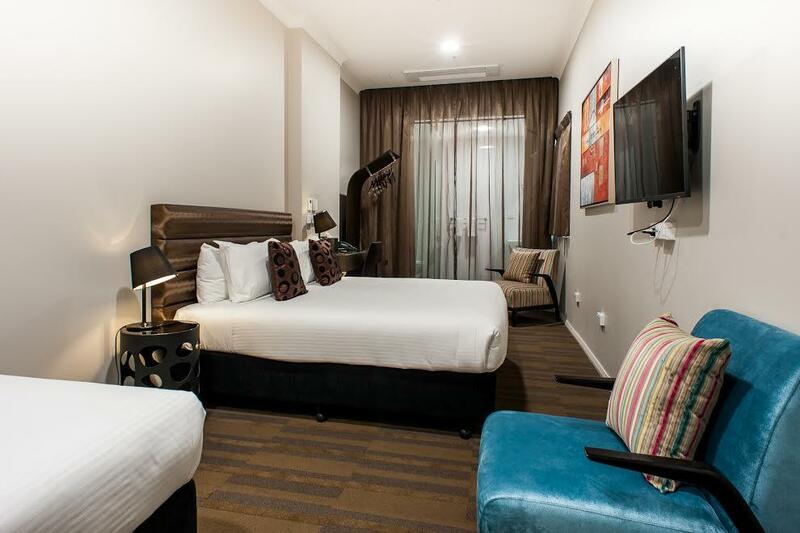 Just a one-minute walk from Central Station and short stroll to China Town and Hyde Park, 57 Hotel is a chic 92-room boutique hotel with an eye for modern design and a distinctive 70s style. Located in the epicenter of Surry Hills' vibrant renaissance, the retro-inspiring 57 Hotel evokes the youthful spirit of its neighborhood with buzzing wine bars, gourmet food stores, gelato bars, and some of the most creative dining spots in Sydney. 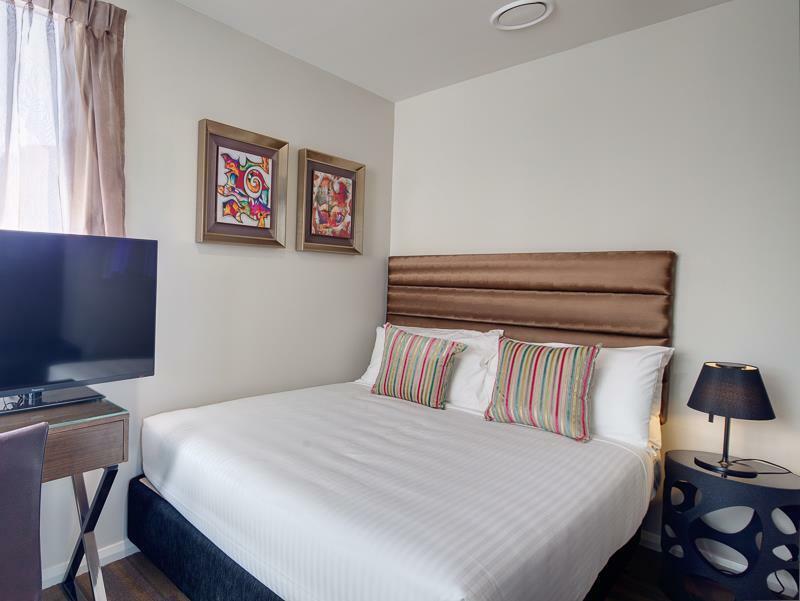 Rooms are funky in design with all the comforts such as luxurious bedding, free Wi-Fi, free local calls, 42" HDTV, Ipad, and even a playlist for you to enjoy. The property offers a complimentary express breakfast that comprises of pastries and coffee and tea in the lobby. There is also an off-site 24/7 gym access. 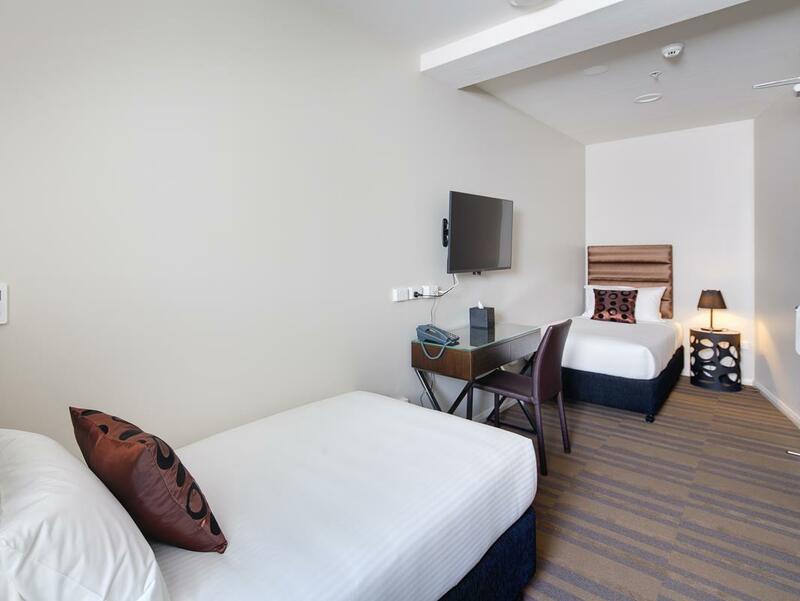 57 Hotel is a 30-minute walk to Circular Quay, Sydney Opera House, and the Royal Botanic Gardens, where you can view the iconic Sydney Harbour Bridge. "Great rooms with elegant high ceilings and modern european d..."
A surcharge of 1.4% on Visa and MasterCard, and 1.85% on American Express apply to any transactions made at the property. There is a fee of AUD 530 for smoking in the guestrooms. 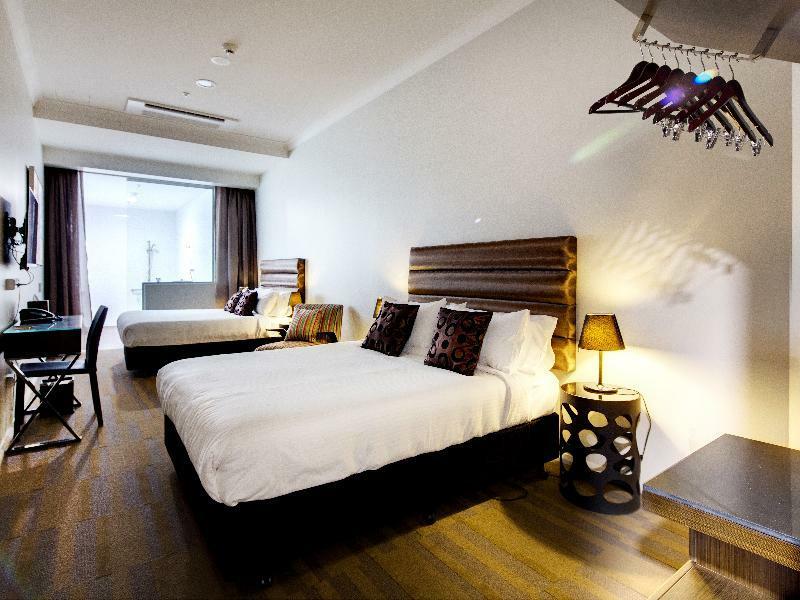 We chose this hotel for its location, just a couple of minutes' walk to Central Station. The place is well presented and the free coffee in the lounge is a nice touch. The room itself left room for improvement. Our room only had a frosted glass window (so didn't really have any outside view) and the bathroom was a strange design, requiring occupants to close a glass door plus a curtain in order to use the toilet without being in full view of other guests. The bathroom tiling was strange as there was a step up against the wall that we kept banging onto but it appeared to have no real purpose. The rest of the room had other odd quirks, like the hairdryer needing to be kept in a drawer in the main room rather than the bathroom, as there was no drawer in the bathroom. It seemed like the place was a victim of trying to look cool but lost a lot of practical function in the process. In short, the hotel is satisfactory for a night or so but any longer and I'd get annoyed by the above. Located very close Central and easy walks to CBD, Darlinghurst, Haymarket and Redfern. Room was comfy, enough space to spread out and nice bathroom. Staff very friendly and enjoyed the coffee selection and water in the lobby. Lots of good restaurants nearby. Who could ask for more? Great location, room was decent size, clean and comfy. Avoid ground floor rooms as soundproofing is poor - noise disruption from guests and housekeepers early in the morning. Overall still a pleasant stay with a nice touch of complimentary coffee and pastry for breakfast. 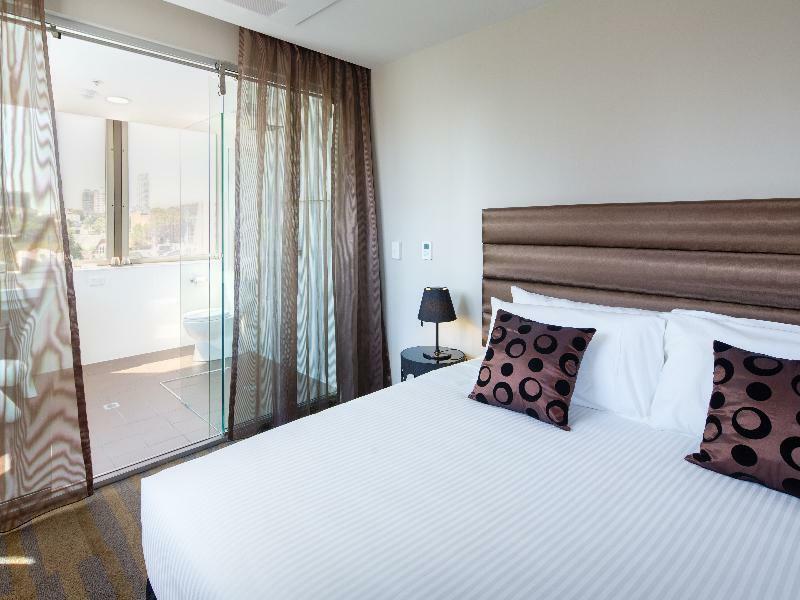 A modern, clean hotel, a short walk from Central station. The room was lovely. I got one of the bigger rooms, and it was fine. The only disappointment was breakfast which was just some pastries, apples and muffins. On the upside there are free hot drinks and water in the lobby. I liked the disco lifts because I feel uncomfortable in small spaces, and the music/lights helped me feel better than I usually do! We book a room for 3. The room was okay despite the bathroom look as if a balcony transform into a shower unit. No proper door. Breakfast is light. Staffs were helpful thiugh some information was misleading. Overall, if you looking for a place near to central station which just across the street and a mini- tesco kind if shop, look no more. I like that the provide free water bottle, coffe , etc but the bed is so small and not comfortable. It caused me having back pain after 2 nights staying there. Not sure whether it is applicable for other type or room because I booked a single bed room. All in all a good stay, excellent location, within 5 minutes of the Central Train Station, less than that of several eateries and pubs. There is a 24h self service coffee machine (biggest Nespresso machine I've ever seen), some fresh water and (sometimes) snacks, but noone should ever pretend that this constitutes any kind of breakfast. If you are looking to have true, hearty first meal of the day, save the extra $$$ for the breakfast inclusion and walk one minute up the street to Le Monde. There were other choices in the area as well but this was our favorite. I travelled with my wife and 14 year old staying 3 nights. Amongst other criteria such as location and ratings I choose 57 for its free breakfast. It was a surprise to me that breakfast was in fact a "grab and go" arrangement of croissants, pastries, muesli bars and apples. No gluten free options available. On the weekend the pastries option wasn't available as the bakery wasn't open to supply those foods. The "grab and go" arrangement needed to be better conveyed when booking the hotel and gluten free options should be always be available. On a positive note the free water was a great initiative and so was the free Nespresso coffee machines. With 2 coffee machines 1 could have dispensed full cream milk and the other machine low fat milk. The room was suitable for 3 adults, well presented and quiet. We were on level 4 away from the lifts. Staff where always friendly and helpful. The location was brilliant. Only a short 300m or so to Central Railway Station. Thank you for taking the time to share your comments with us and for choosing our hotel as your accommodation choice during your recent visit to Sydney, We are extremely concerned to learn of your disappointing experience during your recent stay and would like to apologize for the inconveniences that you have experienced. We do take all feedback seriously and we will investigate the departments and areas you have highlighted, to take the opportune measures with the aim of avoiding such inconveniences in the future. We would invite you to reach out to us on your next visit so we can ensure that we find the best room, equipped with your needs as a traveller. We hope you will give us another opportunity to provide you with an enhanced stay and look forward to welcoming you back to 57 Hotel. We stayed on the 6th floor and I was SO impressed. I usually have a hard time sleeping in CBD Sydney hotels because the traffic noise keeps me up since I'm a light sleeper. Not a concern here. The rooms are very small, but if you're like us - it's just a pit stop. The bed was nice (small but was sufficient for us), very classy use of the space, the hotel itself is very chic and new looking. The light breakfast (muffins, pastries and drinks) was perfect for us. There's unlimited bottled water, which was great it the 33+C heat. Friendly staff, easy check in and check out. VERY convenient location, literally across the street from Central station. 100% staying here again. Great rooms with elegant high ceilings and modern european decor. Found a great deal and the Staff were very welcoming and helpful. Perfect for what I needed. Very Clean. Chic feel in a fun area. Loved it. location was good. about 10-15 minute walk to Chinatown. About 5-8 minute walk to Central Station. If you are bold like me who likes to get the lay of the land, you can practically walk to Circular Quay in like 25-30 minutes depending on how fast you walk. Word of caution, the metro lines from Central Station to Circular Quay on the weekend is substituted with bus line #5, free of charge. Although I don't know how long the change of service will last. The room I stay in was nice although it would have been nice to have a frig to store cold drinks. Wifi was free in the room, signal and speed was good. A small safe is provided to store valuables in which I used, nothing missing by the way, hahahaha. Tour package lobby agent suggested (AAT Kings) was good. Overall, I would stay here again on my next visit to Sydney. Staying at the 57 Hotel is Always something that makes my stay in Sydney complete. The staff, the services & amenities are top class. Perfect location in the CBD & they honor what they say & our always try to assist on all of our requests. My hope is that they’ll maintain this throughout & I will Always be their guest whenever I stay in Sydney. very well located nearby, in no sweat walking distance, central station. small, modern, but suffice. Self service pastries morning and free flow coffee machine. location and coffee, that's more than convenient to us. Thank you for the great review, we are delighted you had a great stay with us. A bit of a walk from CBD (not that bad if you like walking), very near central station. There's a grocery and pharmacy at the end of the block. lots of restaurants around. Rooms are of decent size - very clean and comfy. Value for your money. Last minute decision to stay one more night in Sydney and made a last minute booking at 57 Hotel after staying the first few nights. It was the best decision of the entire trip to book my accommodation at this hotel. The service was great and they actually remembered that I'd stayed here before. 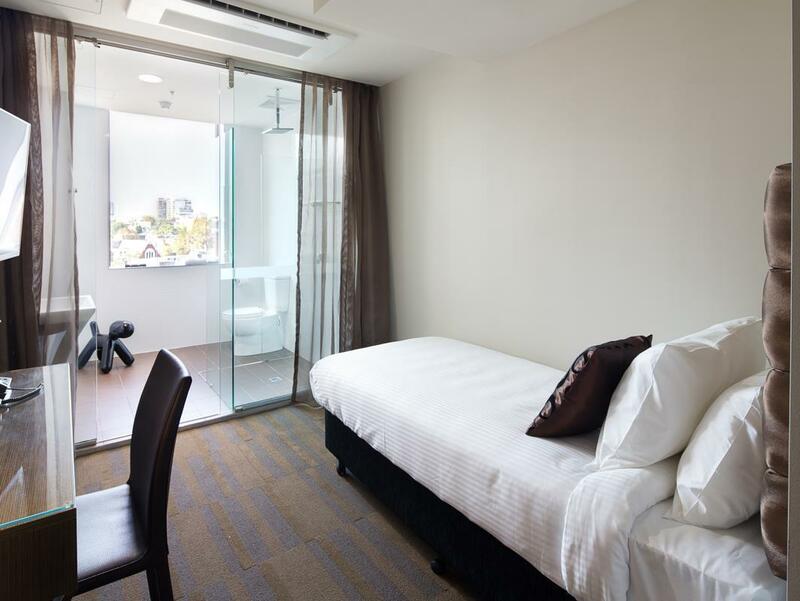 The hotel is conveniently located near Central station, and within walking distance from many great cafes. Highly recommended, and I would definitely stay here again when I visit Sydney. Had a really great stay at 57 Hotel. 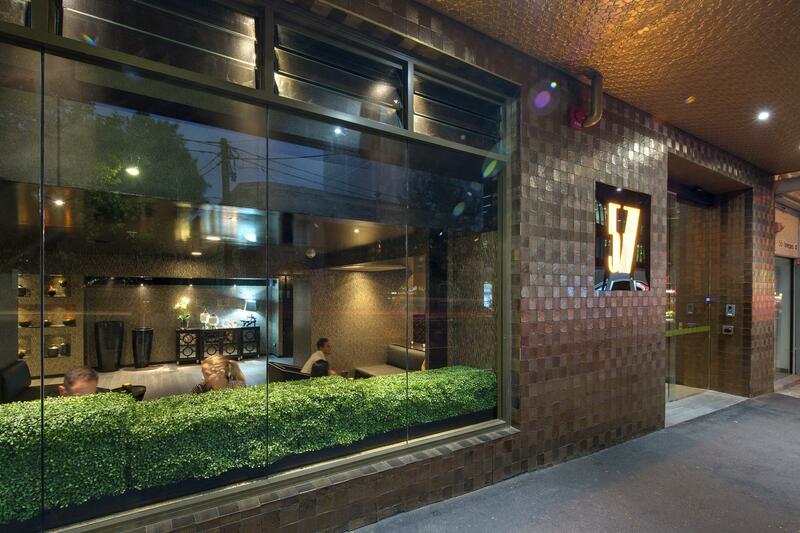 It was conveniently located near Central station, and in the midst of the many cafes in Surry Hills. The bed was very comfortable and the room was impeccably clean. The staff were also very friendly and welcoming. Definitely recommended! I had a great stay here for 9 nights. Check in and check out were fast. The location is really great, less than 2 mins walk and I was right at Central Station (North Concourse exit - Elizabeth St). There was a Metro grocery store at the corner and 7 Eleven. Just further up (maybe 15 mins walk) there was the Bills cafe serving really great ricotta pancake and the Messina ice cream shop. From Bills, I was also able to walk to Paddington Market (30 mins of stroll). From Central, I also just walked to the Haymarket and Chinatown areas. The hotel itself was clean and cozy. My room was for single occupancy, but it was big enough for me, way bigger than Tokyo's average hotel rooms. I was impressed on how clean it was, especially the toilet. The design was modern and simple. My room was cleaned every day and I really appreciated that. Toiletries were of good quality too. There was no fridge in my room, but I don't really use one anyway so it was not a big deal for me. There were free cold bottled water downstairs though. There were also free pastries for breakfast and an unlimited Nespresso and teas. The staff were really nice and friendly. As my flight was delayed and check out was at 10 am, they kindly let me leave my luggage first while I roamed and shopped. Overall, I had a great stay at 57 Hotel, and I would definitely be staying there again if I go back to Sydney.